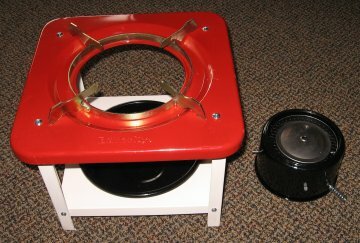 The Butterfly #2487, 16 wick stove is the first Butterfly stove I have used which is large enough - and strong enough - to hold a large stock pot or water bath canner. I decided to put the #2487 to a tough test, boiling 4 gallons of water in a tall stock pot while breaking in the stove. During break-in, the wick tops are hardening and thus are not properly trimmed until after the first good burn, so the maximum heat potential is not reached. Nevertheless, the Butterfly #2487 shown below brought 4 gallons of water to a boil inside of 25 minutes. This stove is capable of canning or large pot simmering, like reducing/condensing tomato sauce or maple syrup. The maximum heat output is also easily sufficient for baking bread using the Butterfly #2421 oven. 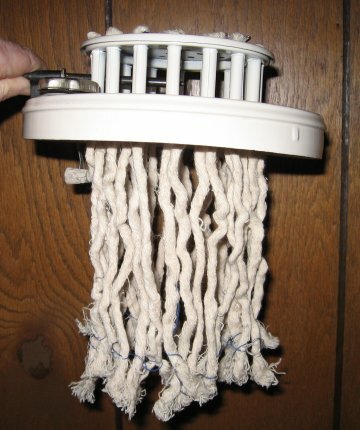 Yet by lowering the wicks, a low heat can be maintained for frying eggs or whatever without burning. This stove is the best one for use with the Butterfly #2421 oven. The Butterfly #2487 comes completely assembled except for installation of the supplied wicks. I use a foot long piece of soft wire with a fold for a hook at one end, fold the wick in half, and pull the wick up through the wick tube from the bottom. The height of the wick above the top plate is irrelevant at this point. 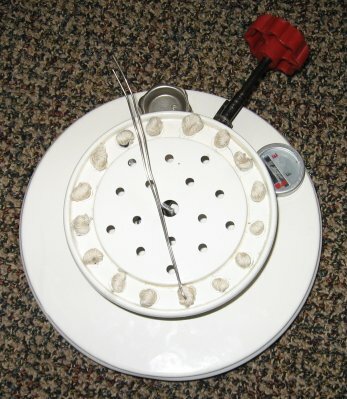 It is important to note on the photo at left the raised outer ring around the wicks and the raised inner section - those raised sections are the guides for proper, level wick trimming. As with all kerosene powered equipment, the Butterfly #2487 should be broken in for a couple of hours by burning it in a location with draft but plenty of ventilation. The catalytic converter ("burner") unit must get hot for awhile to anneal the steel properly and burn off any protective oil. It is best to do this work at night so you can see the flame height. All kerosene stoves depend upon an even flame height for maximum efficiency. If there is a "flame spike" caused by a wick which is too high, the maximum heat output of the stoves is limited because that one flame spike soot up any cooking utensil if it impacts the base. 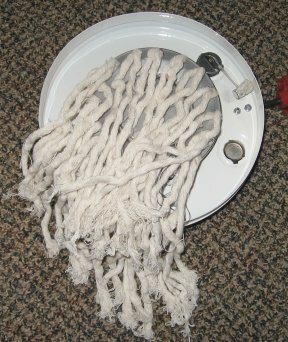 If you have problems evening the height of the individual wicks, see Stove Maintenance. 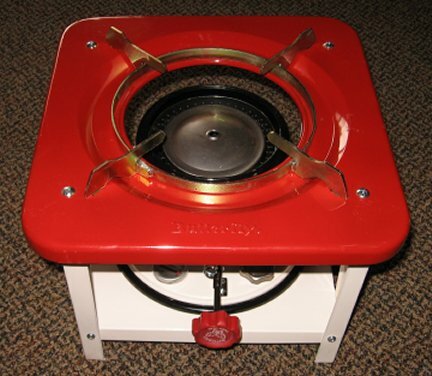 It is common sense to use a kerosene stove near some ventilation, and not move the stove while lighted and hot.